The Expense Claim Form for Excel is a simple yet accurate and effective expense claim and tracking solution for multiple purposes. Tracked expenses can be associated to specific entities such as projects, clients, consultancy services, departments or employees to enable organization of claimed expenses for billing, tax and accounting purposes. The Expense Claim Form for Excel is tracks all types of expenditure items incurred such as travel, accommodation, food and entertainment and is applicable as either a standard template for distribution to employees or as stand alone for calculating and billing back consultancy costs. Customizable by entering company name, attaching company logo and easily adding rows and columns. Includes simple currency conversion functionality. Tracks expenses by project or consultant. Accommodates any type of expense by date, currency, description, and category and it totals correctly to the bottom line. 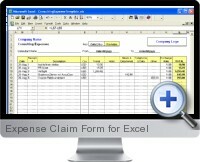 Multiple claim forms from consultants or employees an be rolled to a summary workbook. Functions with all versions of Excel.